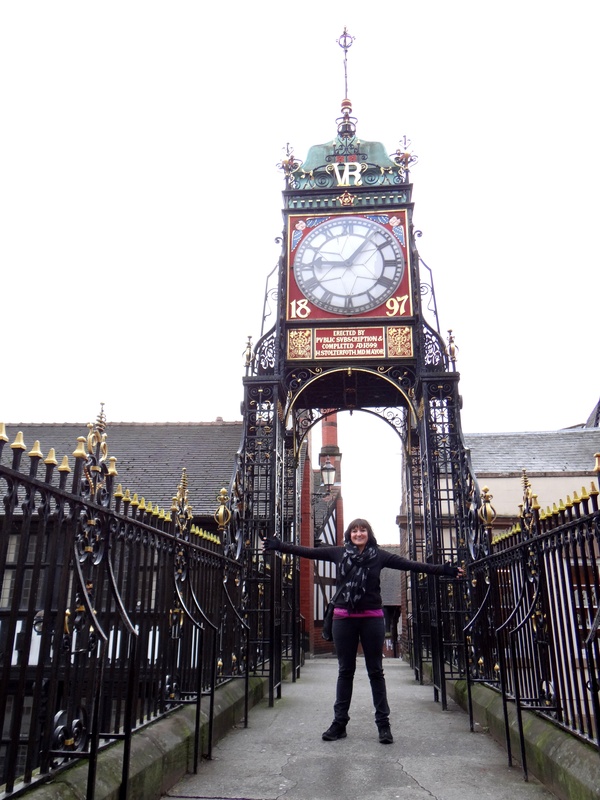 Chester, is a city in Cheshire, England, close to the border with Wales and one of the places I explored with my friend Yvonne while visiting her in Anglesey, Wales. Autumn mornings are quite chilly and we were quite glad that we remembered to take gloves and warm scarves with us although the wall walk did warm us up. 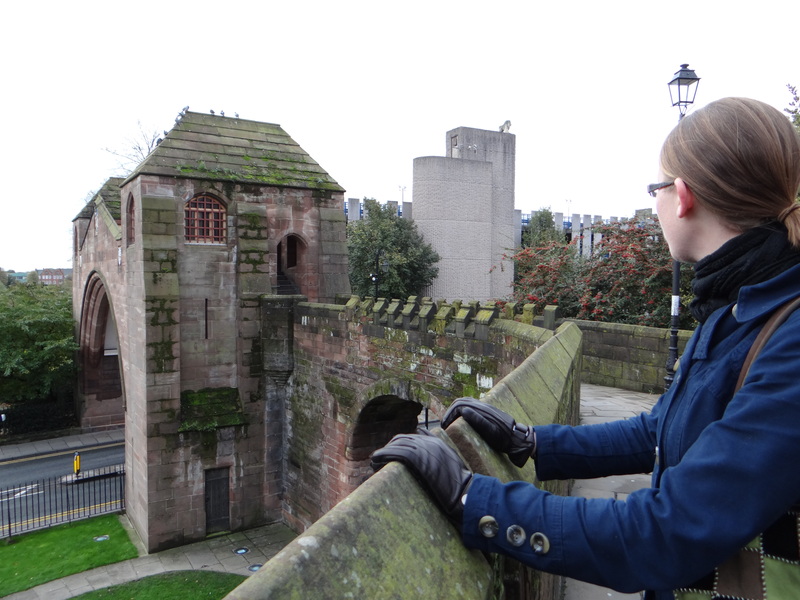 Chester city walls form an almost complete circuit of the city as it was in the medieval era, and measure almost 3.2 km in circumference. The walls comprise the most complete Roman and medieval defensive town wall system in Britain. We started our circular city wall walk at Kaleyards Gate. In the 13th century the monks of St Werburgh’s Abbey had developed a vegetable garden (known as the kaleyard) outside the city walls. Access to it was by a devious walk through Eastgate and they wanted to have an easier route. They petitioned Edward I in 1275 to allow them to cut a gate through the wall to provide direct access to the garden. This he allowed under certain conditions, one of which was that it must be locked at nightfall. 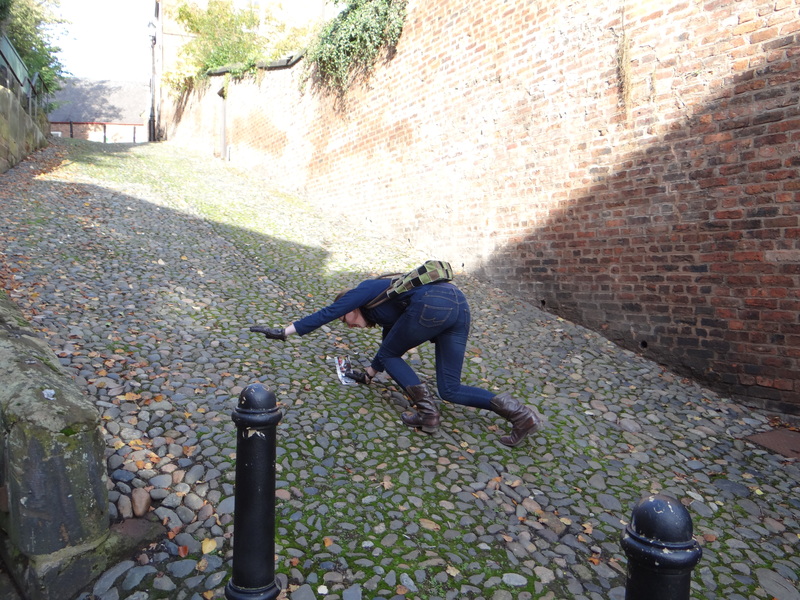 The only other city where I have ever been able to walk around the centre all along the walls was York, which was alsoe an amazing place to explore. 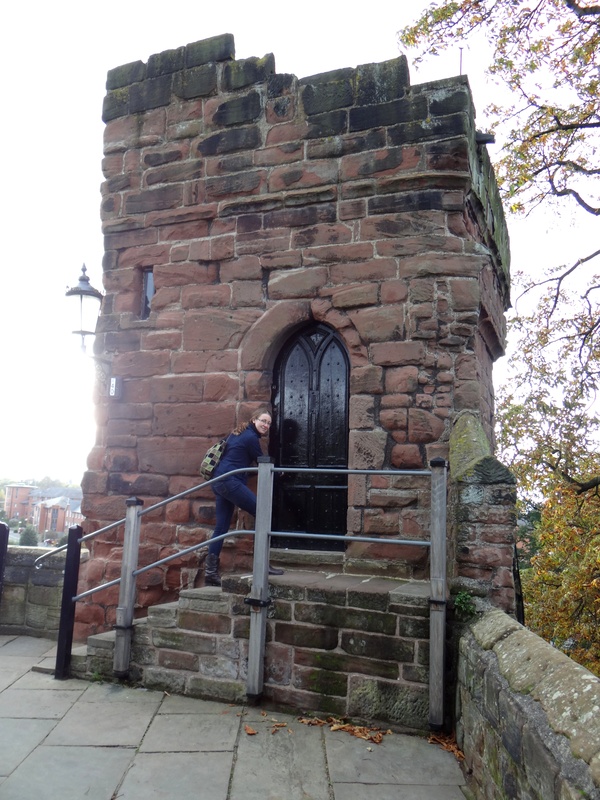 I think the walls of Chester are beautifully preserved and a lovely way to see the city. 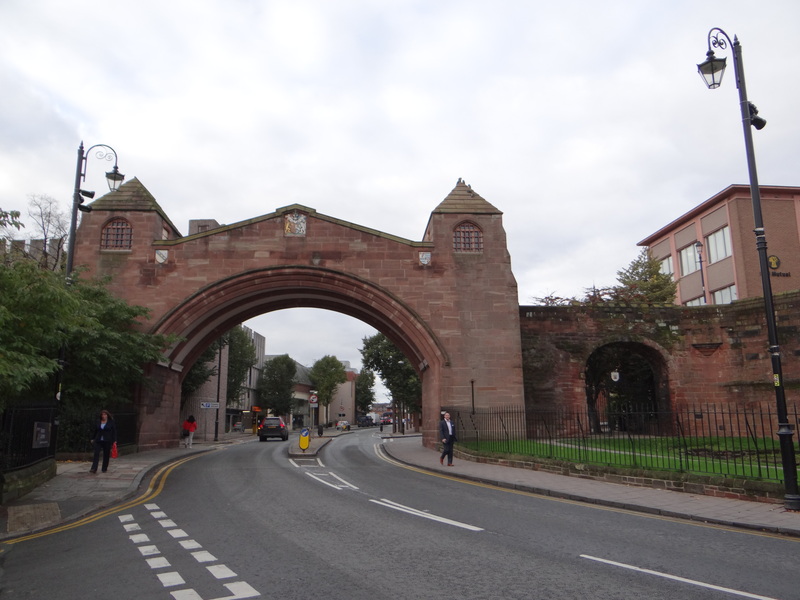 Standing on newgate an arch bridge carrying the walkway of the city walls over Pepper Street. The bridge was built in 1938 to relieve traffic congestion in the city, especially at Chester Cross. The bridge is constructed in red sandstone. On each side of the bridge is a tower containing mock loops (unglazed slit windows) and surmounted by hipped roofs. Flights of steps on each side lead up to the towers and to the walkway across the top of the bridge. Between 1120 AD and 1350 AD the circuit of walls was completed. 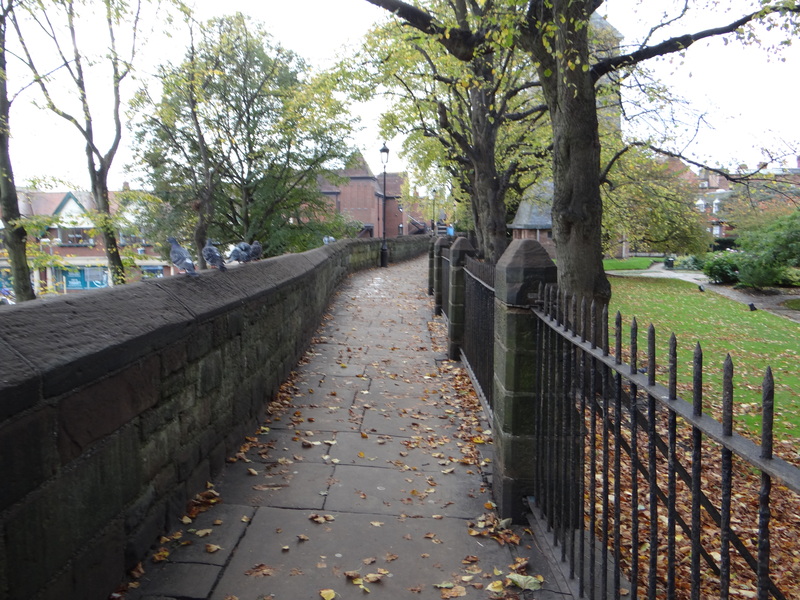 Chester’s Norman earls repaired and restored the existing walls and built the southern and eastern sides facing the river. In the Middle Ages, tall projecting towers and impressive gateways were added. In the 18th century the walls became a fashionable promenade. 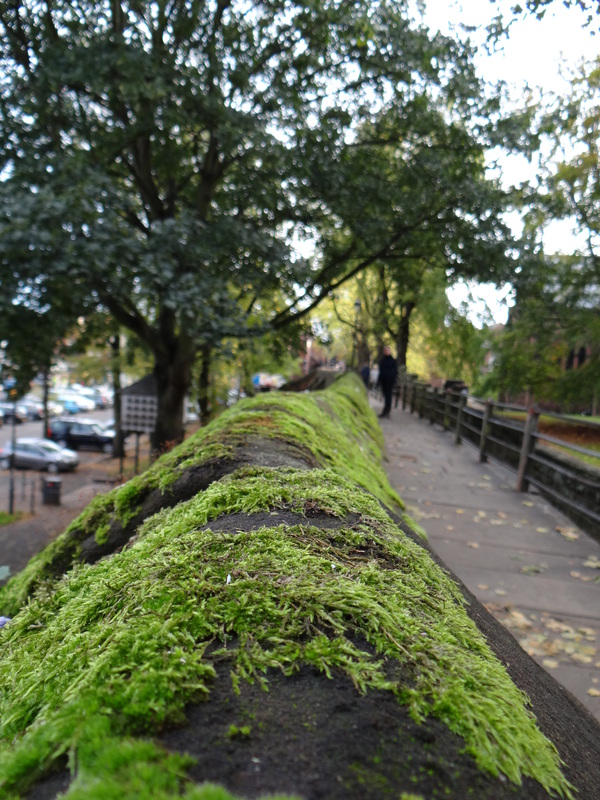 Once the walls had outlived their military usefulness, they were converted to a walkway around the city. The gateways were replaced by elegant arches. Sadly many of the towers were pulled down or altered. 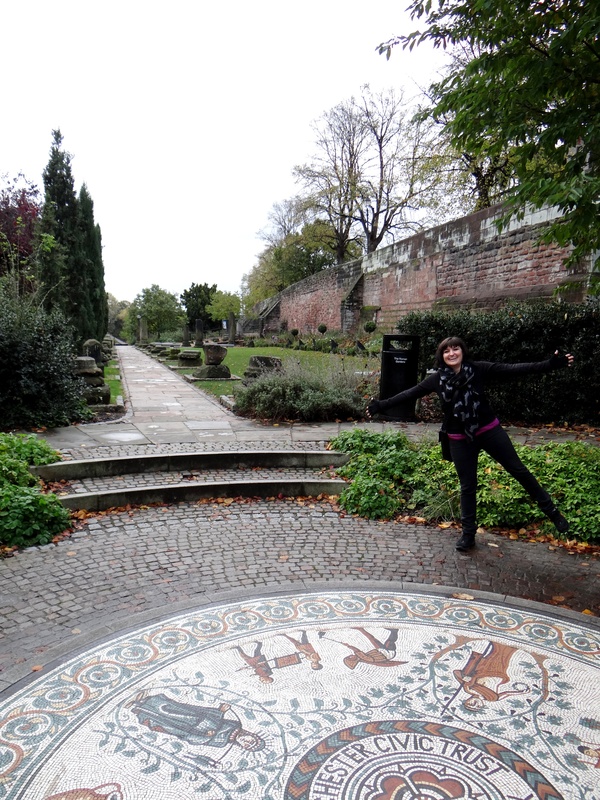 We left the wall to explore the Roman gardens situated next to it. These RomanGardens date from the 1950’s when a public park was created to display a collection of finely carved building fragments from the Roman legionary fortress of Deva. They include pieces from some of the most important military buildings, including the main baths and the legionary headquarters. The City Wall next to the garden is a medieval extension to the Roman defences. 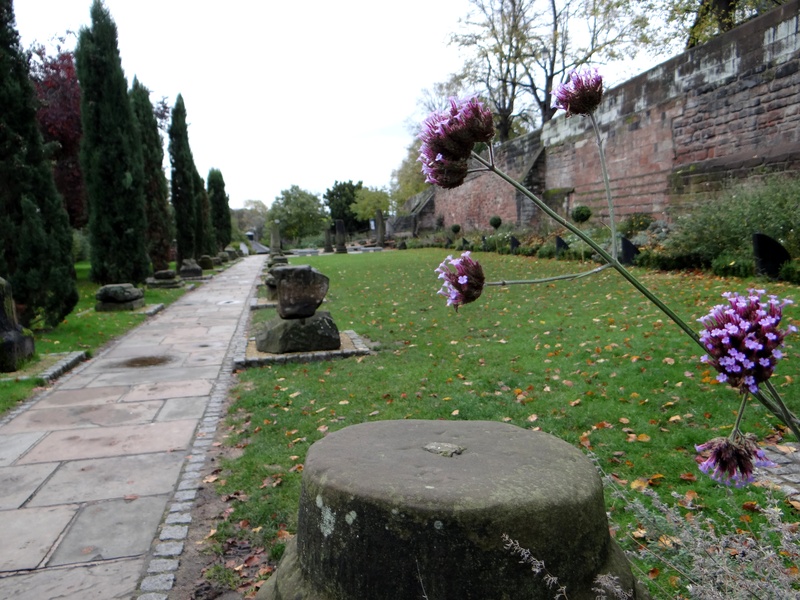 Most of the Roman building fragments now housed in the Gardens were found at the end of the nineteenth century during excavations in Chester. At the top of a narrow winding lane which leads up from the River Dee, along what is probably the steepest cobble lane ever is St Mary’s Church. 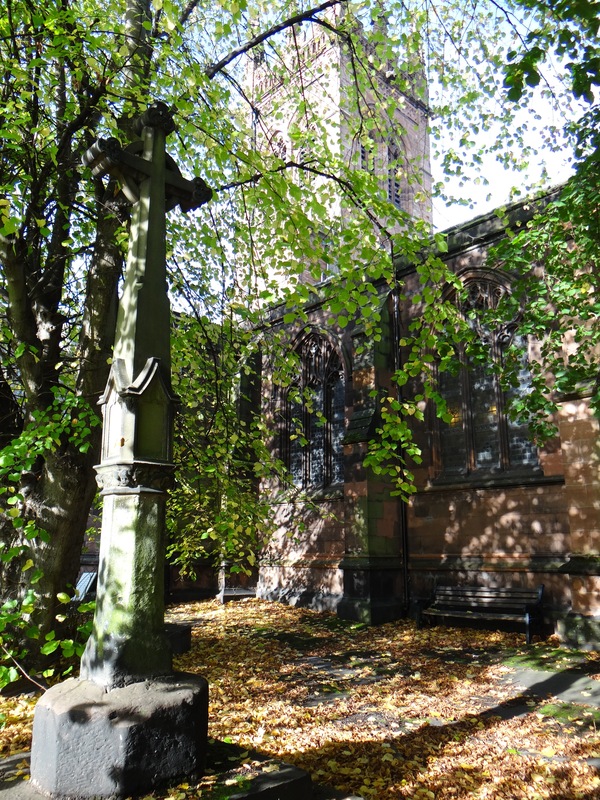 It is said that in 1656 ‘Three witches were hanged at Michaelmas Assizes, and buried in the corner by the Castle Ditch in the churchyard St. Mary’s Church on the Hill. I had a close look at all the graves found in the small cemetery but unfortunately could find any belonging to the three witches. Thats ok, and unfortunately there is no edit button! I had a fabulous Wales adventure! Thank you! I do believe that yopu have to look fopr the beauty everywhere and for the little things that make you smile! 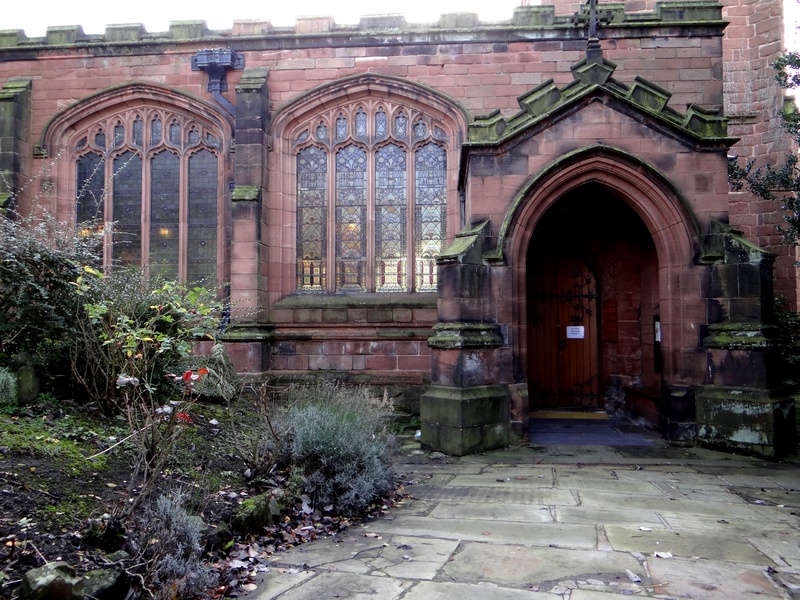 Chester sounds like a fascinating city. I love history (and witches) so visiting a city like this is right up my alley 😉 Adding a new place to my growing list of future travel destinations. Thanks!! Thanks Gayla! 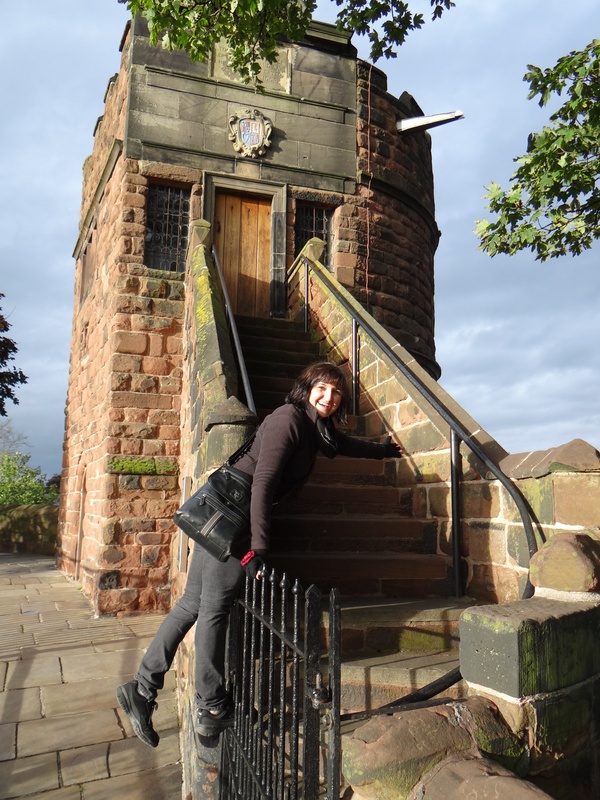 I would definitely recommend a visit if you ever head that way…these old gothic places are just filled with history and myths and legends! Thanks for joining my adventures! A beautiful post with great photos! Lekker! Thanks!! It was very “lekker”!! Janaline, you are a trooper around the world. When do you get time to take it easy? I enjoy it and these adventures are when I actually relax a bit…I find it quite hard to sit still and do nothing…. I do love traveling and enjoy every moment of it! Hope you get to go on an adventure soon! 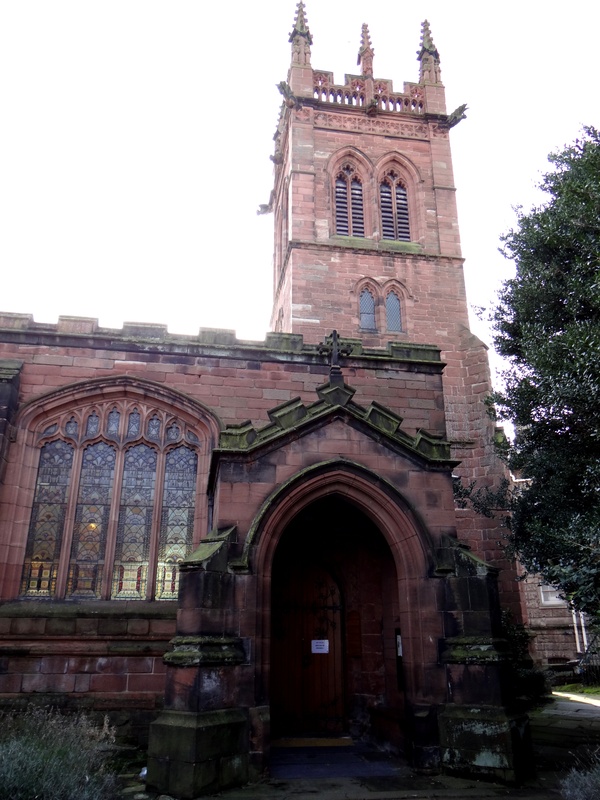 The Medieval Cathedral of Chester, England close to the border of Wales.